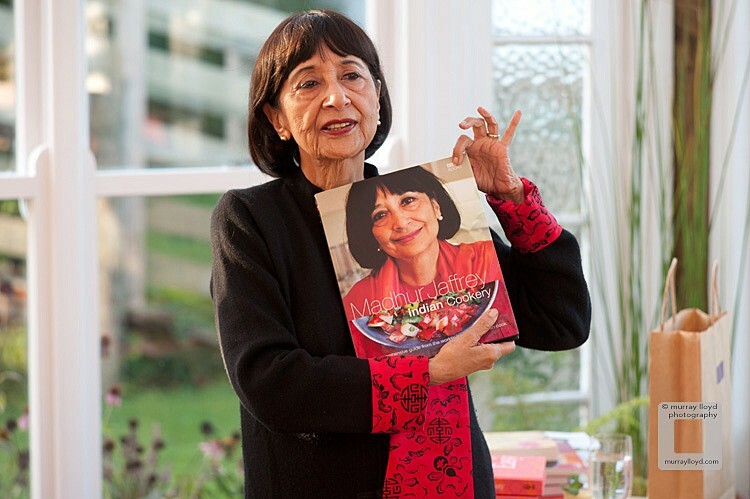 Guests mingled in anticipation of the arrival of food royalty, Madhur Jaffrey to a book signing at Ruth Pretty's Garden Room. Imbibing hot spiced tea and munching muthries the gathering perused a selection of Jaffrey's extensive range of cookbooks. Having arrived at Wellington airport only a couple of hours previous the spritely 78 year old was greeted with loud applause. She then spoke eloquently about her personal and public life. Meanwhile exotic food and drinks circulated. The recipes including dates, seekh lamb kebabs, cheera and shaka para were each from a different Madhur Jaffrey cookbook. The golden sun enriched the already vibrant colours of the Garden Room, decorated for the occasion by the Ruth Pretty Catering crew. The setting struck a poignant note when Jaffrey said her biggest regret is not spending as much time as she would like in her own garden.